Oh Kendall, Kendall, Kendall what are you doing to ME? GAHHHHHH! 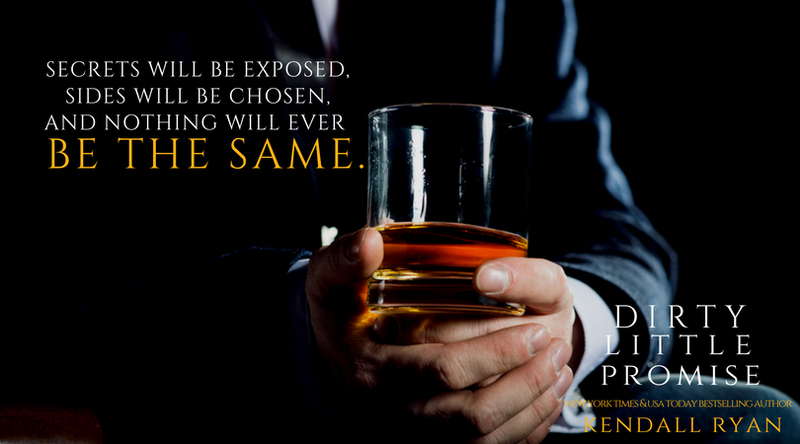 Dirty Little Promise is the conclusion to Emma, Gavin and Cooper’s story and it’s one of those reads you can’t put down. Gotta go to the bathroom? Kindle goes with you. Need to cook dinner? Eh nope don’t think so, gonna have to starve lol. Hey don’t judge me! It was just THAT good! I don’t want to spoil anything here but Gavin just… *Sighhhh* I am utterly addicted! Dirty Little Promise picks right up and in fast pace! Gavin’s’ past comes back to haunt him and Emma finds herself with some difficult choices to make. The business is dealing with a bit of scandal and everything seems like it’s spiraling out of control at warp speed! There is so much goodness going on in this one I can’t stand it! I was on the edge of my seat the entire read! The sexometer was off the chart here 100%! Ms. Ryan you blew me away once again with your mighty words and exceptional story creativity! I loved every single dirty little second I spent with the Kingsley Brothers in this book! I look forward to more, pretty sure I will never get enough these men! York Times, Wall Street Journal, and USA Today bestselling author of more than two dozen titles, Kendall Ryan has sold over 1.5 million books and her books have been translated into several languages in countries around the world. She’s a traditionally published author with Simon & Schuster and Harper Collins UK, as well as an independently published author. Since she first began self-publishing in 2012, she’s appeared at #1 on Barnes & Noble and iBooks charts around the world. Her books have also appeared on the New York Times and USA Today bestseller lists more than three dozen times. Ryan has been featured in such publications as USA Today, Newsweek, and InTouch Magazine. This entry was posted in Blog Tours/Promos, New Releases and tagged Blog Tour, Dirty Little Promise, Emma Bell, Gavin, Kendall Ryan, Review by Book Lovers Obsession. Bookmark the permalink.